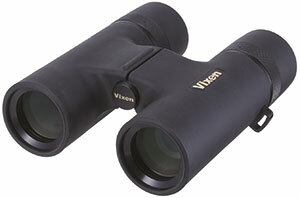 These quirky new binoculars from Vixen have been developed for widefield observation of, for example, the Milky Way. 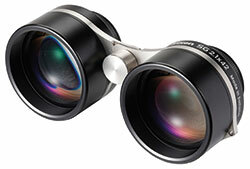 They use a Galilean optic with 2.1x magnification which promises a more "walk in" view than 6x or 8x binoculars. Supplied in a soft carry case, these binoculars have been jointly developed with Miyauchi and are made in Saitama, Japan. *As these are a Galilean optic, there is not a fixed exit pupil, apparent field of view or real field of view. The eye relief figure quoted is to give glasses wearers an idea of whether these will suit their visual set up. Building on the success of the Vixen SG 2.1x42 widefield binoculars, the new SG 6.5x32 WP ED binoculars are high quality in both their build and optical performance. Variable speed focusing allows the user to precisely focus on stars and other objects in the night sky. The ergonomically designed body allows comfort and ease of use, even with gloves. Thanks to the use of ED glass in the objective lens, very sharp images of stars can be obtained, with faint colour differences shown.